Proving to be an unstoppable force, Melbourne-born masters of ‘social disturbance’ and pop punk mischief makers, THE JANOSKIANS will embark on a packed European run called “The Jahoo Jahaa Tour”. 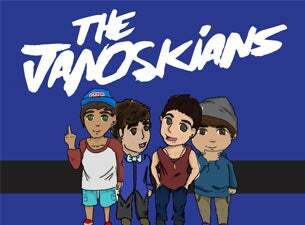 It’s 20+ dates, 5 boys, endless hits and countless Janoskianators. Starting in Dublin on 29 August it moves through the UK and mainland Europe. The tour follows huge success for the band reaching the top of the UK iTunes chart within 24 hours of release with their latest EP ‘Would U Love Me’. It also follows a massive Wembley Arena show in March that entertained a sold out crowd. Alongside this, THE JANOSKIANS, continue to work on their feature film with LionsGate, a fantastic book with Simon and Schuster and another secret project soon to be announced that is sure to get everyone very excited! It’s been a wild few years - in 2011, JANOSKIANS mayhem started brewing when the group uploaded their first ‘Awkward Train Situations’ video to YouTube. As the fan base grew, they continually released hilarious and disruptive content, gaining over 1.9 million YouTube subscribers and counting as well as accruing more than 200 million combined views.